In Goth We Trust, the famous compilation DVD of Polish Gothic is pretty much a historical document covering much of the history of European Gothic music. Polish Gothic has been there from the beginning, in fact, many would say, it WAS the beginning. Indeed, it can be argued that it originated with the fall of Communism in Eastern Europe, or very shortly thereafter. And, arguments are made that the two events have some connection; correlation and causality as they say in the statistics world. Whether that is the case or not, there is no denying the fact that Polish Gothic has been around as long as any form of Gothic. It has its own sound, its own message. 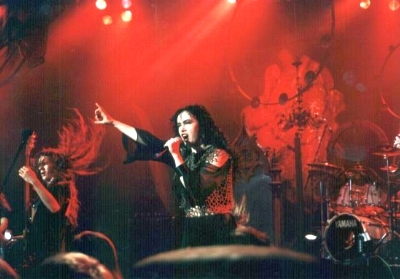 It has its own female metal direction, with bands performing a singular sound that is unique to the Polish interpretation of the Gothic musical art form. Gothic has had many directions, many sub genres. It has often been described as a fusion of the darkness and melancholy of Goth rock with heavy metal, one that results in a dark atmospheric sound. It is also the most predominantly female oriented form of metal. In Poland, this was especially in evidence, right from the beginning. The Berlin Wall fell in November of 1989, you may recall that much of the history that led to that event took place in Poland. The opposition, much of it in the form of the independent trade union Solidarity led by the patriot Lech Walesa, was the impetus for the total dissolution of the Soviet Union that followed. 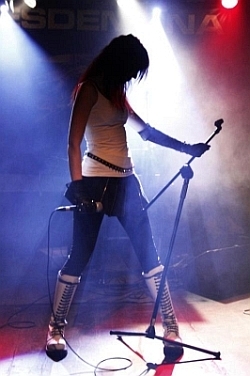 And about this time, a female fronted band Closterkeller was igniting a musical revolution, a dark, brooding revolution that was about to take Poland by storm. Closterkeller, from Warsaw, originated as a band in 1988, releasing their first full production, Purple, in 1991, featuring female vocalist Anja Orthodox. The sound was dark Gothic, a mixture of atmospheric melodic metal with a tinge of electro and pop. Early videos demonstrate the formula that, in a short period of time, brought Closterkeller to godlike status throughout Poland. Their star has hardly declined since. The band has released some 8 studio albums, 3 audio live concerts, a compilation album, 3 mini-albums, 7 singles, 3 DVDs and more videos than I care to count. Of course, the mixture of musicians is also substantial with some 36 performers having contributed to the sound. However, the voice of Anja Orthodox has been consistent, the one single thread that continues to this day. The band’s sound has also remained relatively consistent although there have been diversions over the years. Violins were occasionally utilized and the band flirted with English lyrics at times. However, today the Closterkeller sound remains largely faithful to the original sound. Unfortunately, that sound has been largely relegated to Poland as the band has pretty much stuck to Polish lyrics over the years. And, given the beauty of those productions, one can hardly find fault with that. Although the music of Closterkeller is timeless, it could be argued that their main contribution to the music is the Polish bands and musicians who followed their lead and created a particular style of Polish Gothic. Bands such as Moonlight, Delight, Darzamat, Artrosis, Batalion D’Amour, Lilith and many more continue the sound founded by Closterkeller. Some have faded away into obscurity, others continue to this day. Each presents a singular sound pattern; however, it is not hard to distinguish the Polish sound from others, language notwithstanding. Videos also tend to have a common theme, a dark interpretation of the art form with beautiful music, often symphonic, and with an atmospheric feel making use of a variety of instruments beyond the traditional guitars and drums. And, of course, sung in Polish, a language as beautiful as the music. There is, of course, a hierarchy to the aristocracy of Polish Gothic music. There are always those major sounds that float to the top, that sell in the highest volume, that tend to appear live with the most regularity. And, in Poland, there seem to be many opportunities for live performance beyond the occasional club date. Festivals abound, with one of the largest being Castle Party. It was here, in 1996 that another highly regarded Polish Gothic contingent made its debut appearance. Artrosis presents a sound not that dissimilar to Closterkeller. Again, there is an atmospheric tone, a beautiful female vocal, this time delivered by Magdalena Stupkiewicz-Dobosz (generally known as Medeah), who also plays keyboards on some numbers. The visual interpretation of the message remains dark, an almost existential quality to both the look and feel, to say nothing of the sound. Artrosis is an even more prolific machine in terms of output with some 17 full recordings available to date. Again, the music makes use of a variety of instruments, with strings and keyboards being a significant part of the package. But, it’s a haunting sound, at least in the early years. The current material tends to move towards an electronic and “danceable” direction. Guess that’s called going commercial to some extent, but they do carry on with the basic direction featured in most Polish Gothic throughout even these diversions. Batalion D’Amour is another sound that has been around for a while. The original vocalist, Ania Blomberg, provided a velvety smooth vocal, along the lines of other Polish Gothic vocalists of the time, but left in 2000 to form Dance on Glass in England. Her replacement, Karolina Andrzejewska, is a dark-haired beauty who carries on the look and feel of the band but with a somewhat more dramatic flair. There tends to be a little more focused guitar to their music and a little more harmony via overlaid vocals but, in the long run, the music remains loyal to the Polish Gothic it originated from. Another of the earliest sounds, and one that continues to produce, is Moonlight. The band originated in a school environment and has experienced a number of vocalists. However, one of the original vocalists, Maja Konarska, continues as the lead sound. They’re also prolific having produced some 14 audio and video products through 2007. Again, in the tradition of several Polish Gothic bands, guitars are often relegated to supporting roles, sometimes behind other instruments, strings and keyboards. Vocals, however, are the feature component. That’s not to say they don’t have an axe available to put an exclamation point on the metal, they do, as demonstrated here. But, as is usually the case with Polish Gothic, it’s the vocal that counts. 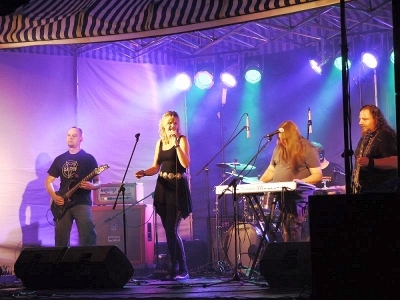 Moonlight is another of the Polish bands that have flirted with English, usually with limited success. It just seems to sound so much better in the native Polish. Beyond this central group of performers, interest would focus on any number of bands depending on personal taste. Darzamat, a band in existence since 1995, performs with a decidedly darker sound, and an even darker message. . . . Desdemona, which can on occasion present an even darker sound, and must be separated from an Italian band of the same name. . . .and Lilith, one of the more contemporary sounds and one of my personal favorites. Each in its own way captures a flavor that can only be described as Polish Gothic, a sound based on beautiful vocals, strong atmospheric musical themes and a direction that takes us back to the beginning. Of course, the sound continues to evolve. UnSun has evolved into one of the bigger names in contemporary Gothic Metal. Poland continues to provide the world with some of the finest in many genres of music, metal and otherwise. But the sound and spirit of the original Gothic, the sound originally developed by Closterkeller will not soon be forgotten. It is a magical sound, a haunting sound, and a sound that has reverberated throughout the International Gothic music community now for some 23 years. And the world is better for it.